Port Augusta based crane contractor MAX Crane and Equipment Hire purchased four Tadano GT-600EX cranes in just six months, all thanks to the efficiency and quality the machines have delivered to the company’s clients. 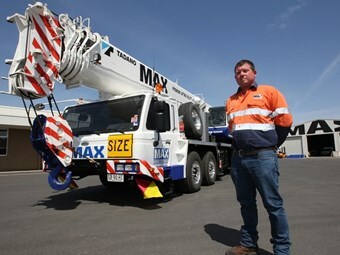 MAX Crane and Equipment Hire heavy lift manager Michael Kuhn can't be happier with his four new Tadano GT-600EX cranes. Operating in remote towns and in the desert through the outback of Australia, the lifting needs at MAX cranes is diverse. Servicing the mining, gas and construction industries, MAX cranes also specialises in the wind farm industry and has contracts with the railways. The company initially purchased two Tadano GT-600EX truck cranes to add to its fleet but the company says the machines have proved to be so good that another order for two more GT-600EX models was placed within months. "We stepped back and looked at our needs," says Michael Kuhn, heavy lift manager at MAX cranes. "To meet our work load and commitments in the Cooper Basin with our oil and gas customers, we felt that the Tadano GT-600EX was the right model for the job." He says several key features on the model such as an impressive lifting capacity and off-road capabilities had him sold. "Initially we were attracted to the Tadano GT-600EX by the lifting chart and the hydraulic suspension on all axles," he says. "Since taking delivery and working with these cranes, they have proven to be a very robust machine with the capability to go off-road and into the desert." The Tadano GT-600EX is wholly Japanese built and features a lifting capacity of 60 metric tonnes at a 3m radius. The model features a fully hydraulic, round box construction type boom and bi-fold fly jib, with the booms reaching 43m when fully extended and a fly jib length of 8.8m to 15.2m. The crane structure is mounted on a Tadano own-brand chassis. Tadano says a key attribute of the crane is that it has been designed to meet the Australian Bridge Formula while carrying all its counterweight, fly jib, second winch and hooks. 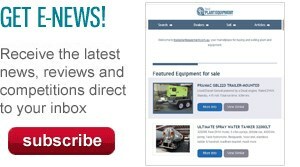 This eliminates the need to send a second vehicle carrying support equipment. While the Tadano GT-600EX is regarded as a truck crane, the hydraulic suspension with independent axles gives the crane all the same attributes as an all-terrain model. Tadano adds the GT-600EX is a more economical purchase choice and easier to maintain compared to other all-terrain cranes. "When the first of our four Tadano GT-600EX cranes were delivered, we were pleasantly surprised," Kuhn says. "They have fitted into our growing crane fleet assembly well and have proven to be a hit with our drivers." Tadano says a main benefit of the GT-600EX model over other all-terrain cranes is its road speed. The Tadano truck crane can run at 100km/h on the bitumen. MAX Cranes workshop manager Brett Woolford is extremely satisfied with the customer service and support he has received from Tadano Oceania. "The communication and factory support has been first rate," he says. "The cranes were shipped from Japan to Adelaide and pre-delivered by Tadano’s agent in Adelaide before coming on to Port Augusta. "The training and verification process all went very smoothly." MAX Cranes currently operates from three branches; Port Augusta, Whyalla and the Moomba Basin together with a corporate presence in the Adelaide CBD area.